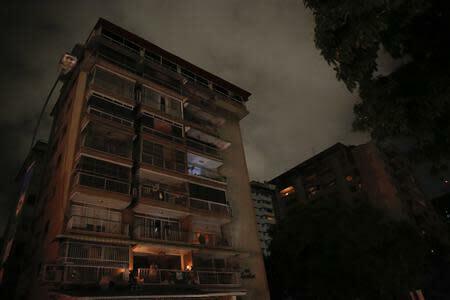 CARACAS (Reuters) - Venezuela's second massive power outage of the year plunged much of the nation into darkness on Monday night, prompting renewed talk of sabotage from President Nicolas Maduro's government and cries of incompetence from its foes. 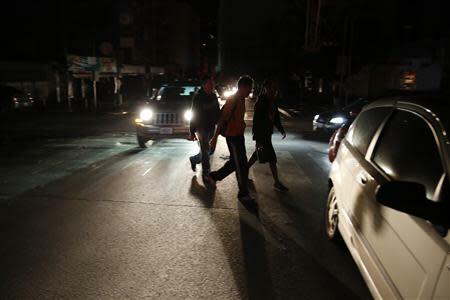 Power went off in Caracas and other cities around the country soon after 8 p.m. local time (0030 GMT), to the intense annoyance of residents and commuters. "I feel so frustrated, angry and impotent," said sales adviser Aneudys Acosta, 29, trudging through the rain along a street in the capital after having to leave the disrupted underground transport system. "I live far away and here I am stuck under the rain. Something's going wrong that they're not sorting out. The government needs a Plan B. This is just not normal." Monday's outage appeared similar to a massive September 5 blackout that was one of the worst in the South American OPEC member's history. Maduro, a 50-year-old former bus driver who narrowly won a presidential election this year after the death of his mentor and former leader Hugo Chavez, accused the opposition then of deliberately sabotaging the power grid to discredit him. His powerful ally and National Assembly president, Diosdado Cabello, repeated the same accusation after Monday's blackout that affected more than half of Venezuela. 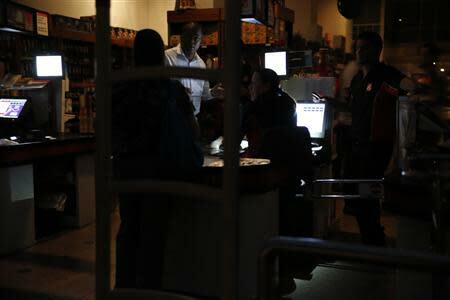 "I have no doubt that today's electricity sabotage is part of the right-wing's plan," Cabello said on Twitter. In some wealthier parts of Caracas, where opposition to the socialist government is strongest, people began banging pots and pans out of their windows in a traditional form of protest. Venezuela has been suffering periodic electricity cuts around the country since 2009, although the capital has been spared the worst outages. Critics say the power problems symbolize the failure of the government and its 15 years of socialist policies in resource-rich Venezuela. The country has the world's largest crude oil reserves and big rivers that feed hydroelectric facilities generating two-thirds of its power. The blackouts, some due to planned power rationing and at other times to utility failures, have not affected the oil refineries, which are powered by separate generator plants. State oil company PDVSA said its installations were all working normally on Monday night, with fuel supplies guaranteed. Electricity Minister Jesse Chacon said the same major transmission line that went down in September - and carries about 60 percent of national supply - had again been affected. Power began returning to most parts of Caracas within an hour or two, though remoter parts of the nation of 29 million people were still in the dark late into the evening. "We ask Venezuelans for patience," Chacon said. Maduro was giving a live address on state TV when he was abruptly cut off. He later Tweeted that he was continuing to work in the presidential palace despite the "strange" blackout, and appeared live on state TV surrounded by school children. "Be strong against this electrical war that yesterday's fascists have declared against our people," Maduro said in another address to the nation at about 11 p.m. local time. Security services were on alert, while the oil industry had been "put on emergency", the president said. Since winning office in April, Maduro has accused political opponents of conniving with wealthy businessmen and their allies in the United States to undermine his government. As well as accusing them of sabotaging the power grid, he has alleged plots to assassinate him and to destroy the economy through price-gouging and the hoarding of products. Venezuelans are suffering from a 54 percent annual inflation rate, as well as scarcities of basic products from flour to toilet paper. Nationwide local municipal elections on Sunday are seen as a major test of Maduro's standing. Opposition leader Henrique Capriles said government officials' bellicose statements were "pathetic" at a time of national disquiet. "For once in your lives, be responsible," he Tweeted. Capriles and others say the reasons for the power failures are obvious and simple: lack of investment, incompetence and corruption within the state-run power company Corpoelec since Chavez's 2007 nationalization of the sector. Venezuela has a maximum generation capacity of about 28,000 megawatts and normal demand of about 18,000. The government constantly chides Venezuelans, however, for wasteful habits in a nation where the average household consumes an average of 5,878 kilowatt hours per year, about double the average in Latin America.